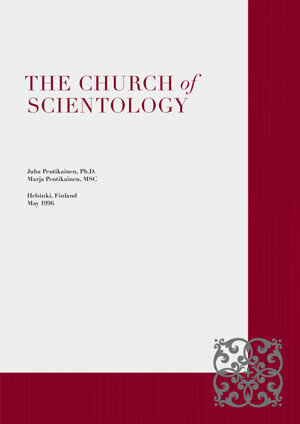 The Church of Scientology - Juha Pentikäinen, Ph.D.
ABOUT PREFACE I. II. III. IV. V. VI. VII. VIII. IX. X.
Juha Pentikäinen, Ph.D., is professor emeritus of religion at the University Helsinki (Finland), founder of the Institute of Comparative Religion at the Univeristy of Tromsö (Norway), and professor of northern ethnography at the University of Lapland, Rovaniemi (Finland). After having received his Ph.D. degree from the University of Turku in 1968, he was appointed to start the new discipline of the study of religions at the University of Helsinki in 1972. He has been a visiting professor of the study of religions, cultural or social anthropology, folkloristics and Scandinavian Studies in the Universities of California (Berkeley, Los Angeles), Texas (Austin), Minnesota (Minneapolis), Indiana (Bloomington) and Rome (Sapienza). He has been the Delegate of Finland in the United Nations and UNESCO and is the member and advisor of several work groups and committees nominated by the government and ministries of Finland. Dr. Pentikäinen has done fieldwork across the world, giving lectures in more than sixty countries. He is the author of hundreds of articles, dozens of books and numerous films on the study of religion. His books in Finnish have been translated into French and English and include Oral Repertoire and Worldview: An Anthropological Study of Marina Takalo’s Life History (1978) and Kalevala Mythology (revised edition, 1999). In 1995, he was nominated to the membership of Academia Scientiarum Fennica. Marja Pentikäinen, MSc, served as executive chief of the Foreigners’ Office of the City of Tampere. Her doctoral thesis at the University of Tampere was on the subject of the integration of African and Asian refugees in Finland. She has lectured at the Universities of Tampere and Helsinki and offered her expertise as a social worker to expert groups and committees on the subjects of foreigners, immigrants, refugees, their social problems, values and religions, particularly in the context of Finland.